Okay, so blogging while also being President is harder than I thought. I can't believe it's been nearly a month since my last post. What's even harder to believe is that, if my Followers gadget is correct, I have actually gained followers during that time. Thank you to everyone who has signed on and held on. Here's another little tidbit from the storage racks for you. This fireboard has been in the collection since 1950, when we acquired it from Jean Lipman. That's sixty-one years, and I cannot recall it ever being on view. It's relegation to storage is probably owing to the lack of information about it, but it is intriguing onetheless and beautiful to behold. A fireboard, in case you don't know, is an portable enclosure usually made of wood or canvas and used to cover the unsightly fireplace in the summer months. We have a number of these, the most famous of which is our great "Bear and Pears," also from Lipman. This piece is more enigmatic, as the scene it depicts is exotic and mysterious, possibly based on a print or number of prints of foreign lands that so intrigued New Englanders in the nineteenth century. 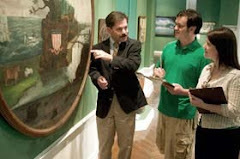 It belonged to a Connecticut collector named Titus Geesey, who felt strongly that it was of Connecticut origin, mainly because the painted decoration along the borders resembled the painted tin designs of local decorators. Other than this theory, we have no information as to its history. "An attempt to interpret this particular pastiche in terms of the life of the time leads me to conclude that limners ate opium on the job; that there were lions large and relaxed roaming (or at least posing) with Amazon women near castles with Mansard roofs; that somewhere in New England there existed a culture in which people came in a variety of sizes." I just love this interpretation. It captures the whimsey of the piece like no academic study could do. And it is a reminder that a fireboard was one of the few art forms that was always displayed at child height. What flights of fancy would have been taken in this parlor. a connection that hadn't been known or realized before. Very interesting piece and food for thought. Thanks for sharing this. You're right about that, CC.We will have to get this out soon. That's the nice thing about blogging; it makes you appreciate what you have too often overlooked.